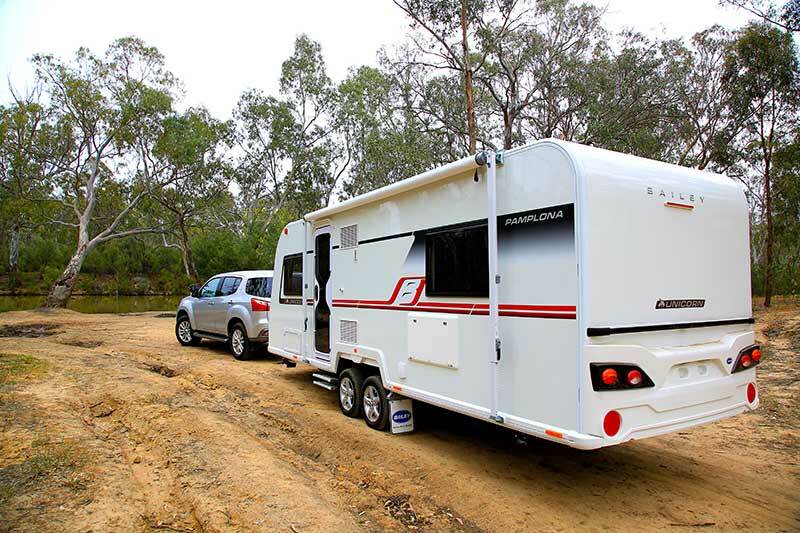 Bailey Australia has furthered its range of locally-built vans. Introducing the Australian-built Unicorn IV Pamplona. Bailey Australia has just launched its promised ‘Australianised’ Unicorn IV Pamplona. If you’ll forgive the brag, we were the first to hitch up this van for an in-depth look. Despite now being built locally, the Unicorn IV Pamplona retains significant British design flair. It is, after all, based on the ‘Bailey of Bristol Unicorn IV Pamplona, one of the company’s most popular models. However, for Australian conditions, the UK version had some limitations, to which Bailey Australia readily admitted. The new Unicorn IV Pamplona sets out to address these limitations. Among the changes: greater ground clearance and payload capacity, larger water tanks, and even a larger entry door. To Bailey Australia, however, it was important the new Pamplona kept that British look. To that extent, I think the company has succeeded. This is a Bailey van through and through, with the light weight, and the intriguing layout features and design cues for which Euro vans are known. The Unicorn IV Pamplona employs Bailey’s interlocking Alu-Tech construction method, which ‘clamps’ the hail-resistant fibreglass sandwich panels together. The roof and wall panels, by the way, are the only main structural components imported from the UK – Bailey Australia is not yet set-up to build its own. But this facility is coming. Otherwise, from the Austrail RV chassis and the lightweight ply cabinetry, to the electrical and plumbing fitout, it’s all built here. Behind our Isuzu, the new Unicorn IV Pamplona was an acceptable towing proposition. Our MU-X hauled it, frankly, as though it wasn’t there. Given its light ball weight, however, the van seemed a little jittery on the tow pin (it uses Al-Ko’s 3.5-tonne offroad pin coupling) at 100km/h. I suspect that once the van was loaded for travel, it would settle nicely onto the towbar. It’s important to note, too, that this van was virtually a prototype – it was the first of its kind. Bailey tells me the van was designed with such a low ball weight to allow customers to load up the front and still have a reasonably low ball weight. Among the external features, there’s a roll-out awning, a picnic table, and a forward nearside ‘wet’ locker. This locker incorporates a liner to protect the timber against soggy towels, wet suits and the like. It is, however, also the main external storage compartment – there’s no traditional front or tunnel boot on the Unicorn IV Pamplona. The locker on the offside is dedicated to the standard 9kg and 4.5kg gas cylinders. With the spare wheel mounted underneath the van, the rear – as with all Baileys – is ‘clean’ and unencumbered. While a traditional Aussie van would sport a steel rear bumper, Euro vans typically don’t. This reduces the Tare weight and, some would say, increases their visual appeal. Speaking of visual appeal, Bailey’s signature panoramic windows haven’t been forgotten. They look fantastic from the outside, but I’d invest in the optional padded cover to avoid stone chips. The Aussie Pamplona also gets a 150W solar panel matched to a 30A regulator and a 100Ah deep-cycle battery. It’s not an extensive setup but it is on par with many of the van’s competitors, suitable for a few days off-grid. The Euro flair and design cues are most on show inside the van. In fact, the layout solves a number of common layout problems in different ways. The front sideways-facing lounges, behind the panoramic windows, serve a few purposes. They could act as single beds, a place for meals (the middle cabinet features a slide-out bench – a great touch), or even as a second double bed. Simply pull out the slats from that same middle cabinet – the slats rest on some edging neatly fixed to the bases of the lounge. Then, fill in the space with the backrest cushions and go to bed. I’ve seen similar arrangements on other vans, but it is done very well here. A lack of kitchen bench space – another common layout problem – has been solved by the simple inclusion of a bench extension, which snaps up and locks into place above the offside lounge, and folds down against the end of the kitchen bench when not needed. The kitchen has also been fitted with large drawers, a sink infill that further increases bench space, a cooktop, griller and oven, a microwave, instant hot water, and a nearside 190L three-way fridge. The kitchen is attractive, uncrowded, and away from the main lounging area. One quick point: generally speaking, I feel that microwaves should be fitted below bench height, and to that end I’d get rid of the oven and fit the microwave in its place, if possible. This would make it easier for people of shorter stature to use the microwave, and – with a cupboard fitted where the microwave currently is – increase kitchen storage. Moving rearwards, you’ll find the bathroom. Separated from the kitchen by a solid door, it is split across both sides of the van, with the cassette toilet and washbasin on the offside, and a separate shower on the nearside. It’s total Euro class. 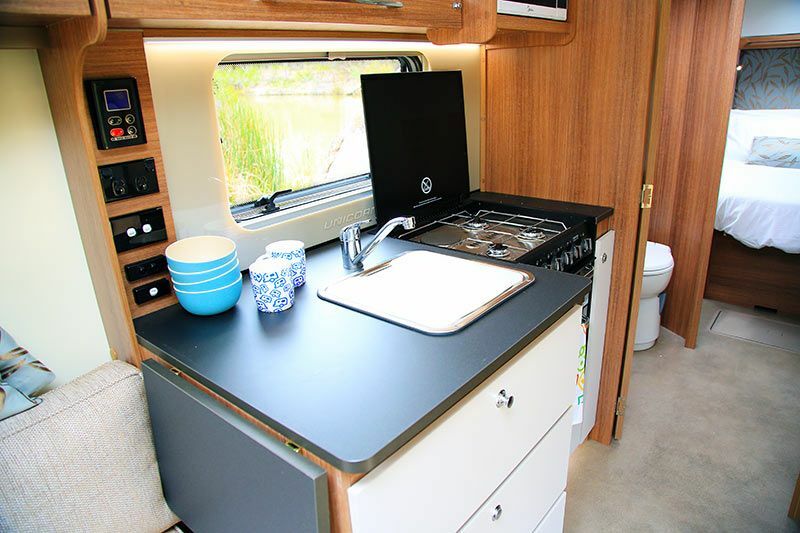 I loved the mini laundry hamper fitted below the washbasin – we haven’t seen too many of these on Australian caravans before. Another quick point: the bathroom light switch is a pull-cord setup. I suppose it adds a little old-time charm. Perhaps. A concertina screen separates the rear bedroom from the bathroom. It is, overall, a sensible bedroom with some points of difference. First – and I almost overlooked this since it’s so discreet – is the washing machine built into a cupboard on the nearside, just beneath the TV’s mounting bracket (the bracket is standard, the TV is optional). Open the cupboard door and you’ll find a small hinged bench for sorting laundry, with the washing machine beneath. It’s very well done. There’s also internal access to the onboard battery via a floor hatch at the foot of the bed – handy for checking connections, etc., should the digital voltmeter show depleted levels. 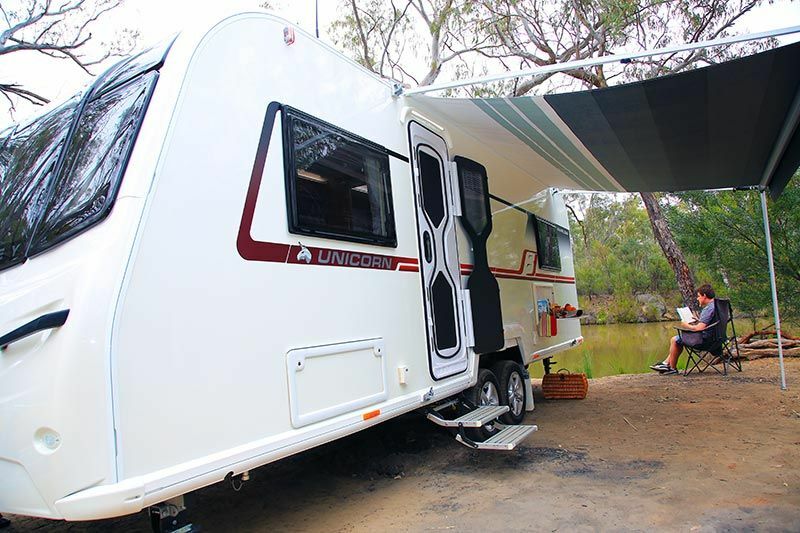 Overall, the Bailey Australia Unicorn IV Pamplona packs a great deal into its 23ft body length, and it does so without the user feeling cramped or boxed in. The layout, while not unique per se, is in keeping with the van’s British heritage. With its split bathroom and rear bedroom, it even provides privacy when needed. And yet… it’s only 1851kg Tare. It can be loaded up with 424kg worth of gear, water, etc., and still be towed by some wagons. It’s size-to-weight ratio is indeed pleasing. Although it’s equipped with some offroad equipment, such as the Al-Ko coupling, the Bailey Unicorn IV Pamplona is very much a blacktop/dirt-road tourer. It will be interesting to see how this van evolves in the coming months and years. The fact it’s now built locally, rather than being imported from the UK, should make it easier for Bailey Australia to adapt the van according to to customer feedback. In any event, this is one van to put on your must-inspect list.